The top trending living rooms provide a wealth of decorating ideas — whether it’s adding stylish wallpaper to the ceiling or embracing the power of symmetry. 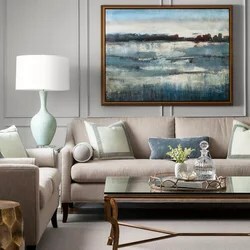 The ideas that follow come from the most popular living rooms as measured by the number of people saving photos of them to their Houzz ideabooks recently. See if any will work in your home. Like a cherry on top, wallpaper on the ceiling can put the finishing touch on a room. This Canadian living room features Cole & Son’s Malachite, from the Fornasetti collection, which adds whimsy and depth to the space. 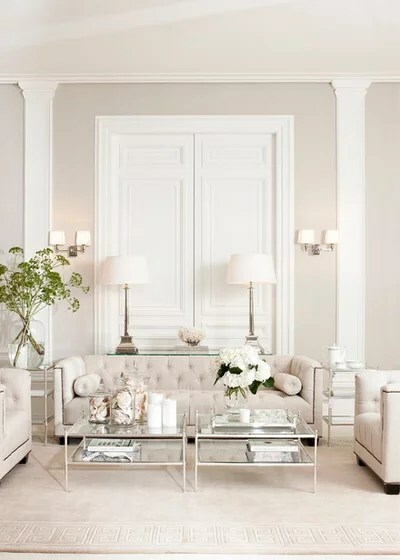 This sublime living room in Perth, Australia, shows the power of decorating a space in similar color tones. 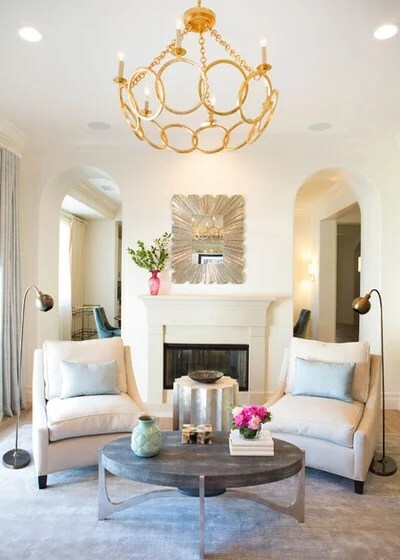 From the walls to the tufted furniture to the Greek key-bordered rug, this space is awash in shades of beige. The overall effect is soothing and confident. 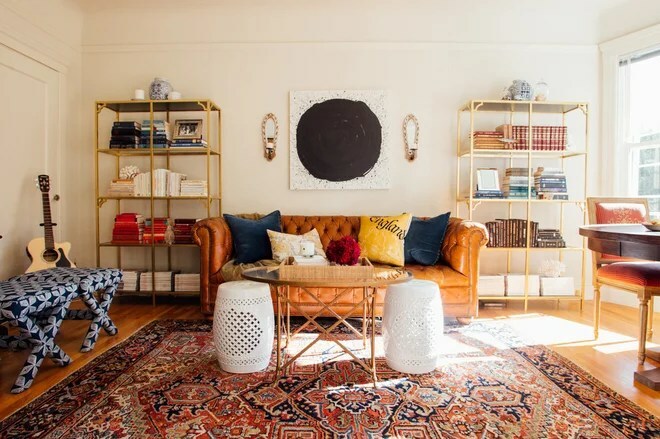 For the bibliophiles out there, having books integrated into living room design is often a must, but that doesn’t mean you have to be boring about it. 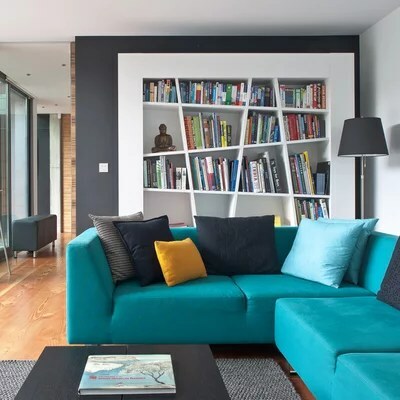 This custom bookshelf in London is a great example of how shelving can be an exciting interior element. It has been said that symmetry is the key to beauty. 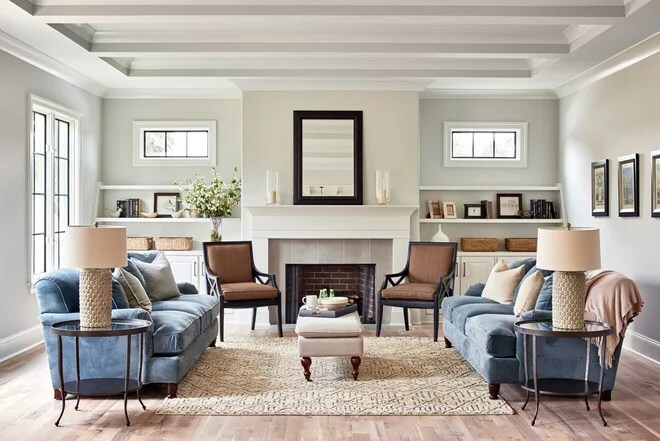 If that’s the case, this Charlotte, North Carolina, living room designed by Chuck Frusterio is a knockout. The placement of the sofas, chairs, end tables and lamps is mirrored on both sides of the fireplace. Placing a flat-screen television above the fireplace tends to be a love it-or-hate it proposition. A Séura television mirror might be the answer to make everyone happy. At the touch of a button, it transforms from a TV into a decorative looking glass — and no one is the wiser. If you want to make a statement in your living room, there may be no better vehicle than a stellar chandelier. This minimalist Los Angeles living room designed by Lori Dennis features a Currey & Company light fixture that steals the show. A reading corner in a living room often evokes an image of an overstuffed upholstered armchair and a traditional reading light. 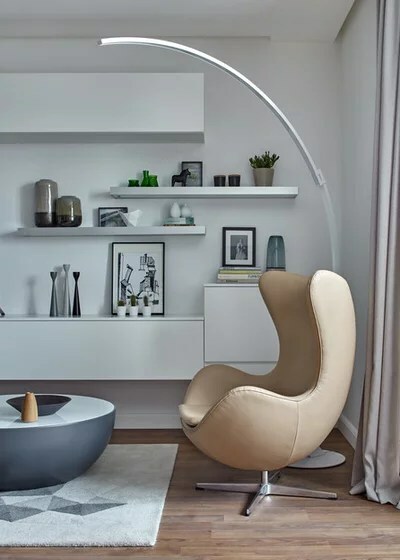 But this Russian living room shows that you can create a sleek reading corner with modern pieces like this leather Egg chair and Kyudo floor lamp. 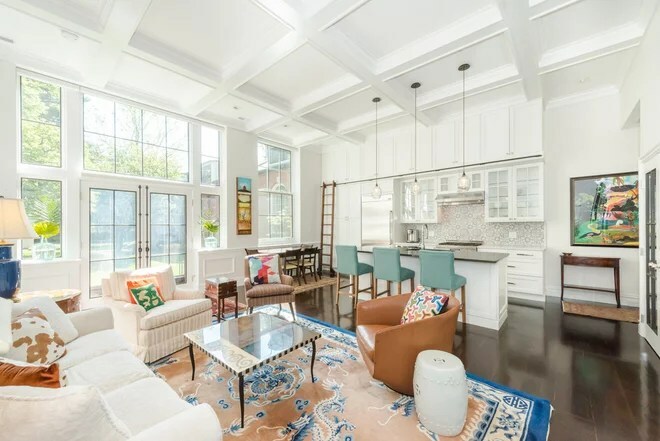 Open floor plans have been popular for living rooms for some time, and this impressive living space in a former Boston area school converted by SWZ Architects is a terrific example of why the layout continues to draw adoring fans. This Toronto living room designed by Catherine Alison Interiors illustrates how a piece of art can both unify the colors in a room and add an element that draws your attention without overpowering the space. 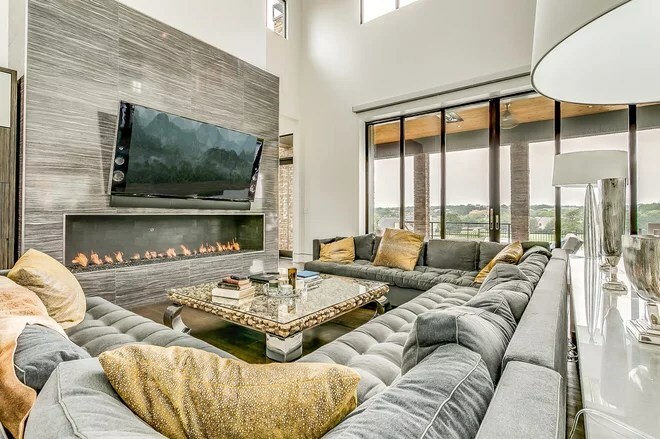 They say that everything is bigger in Texas — and this Fort Worth living room seems to confirm it. 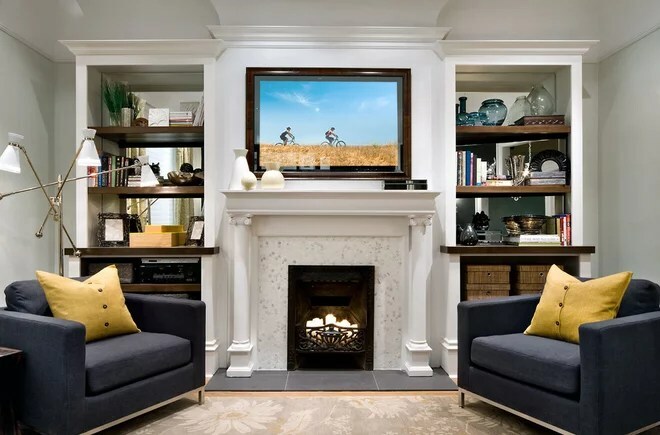 With its massive sectional, large flat-screen television and extra-wide gas fireplace, there’s plenty of space for a movie night with family and friends. Most of us want a calm, soothing vibe to permeate our bedroom. 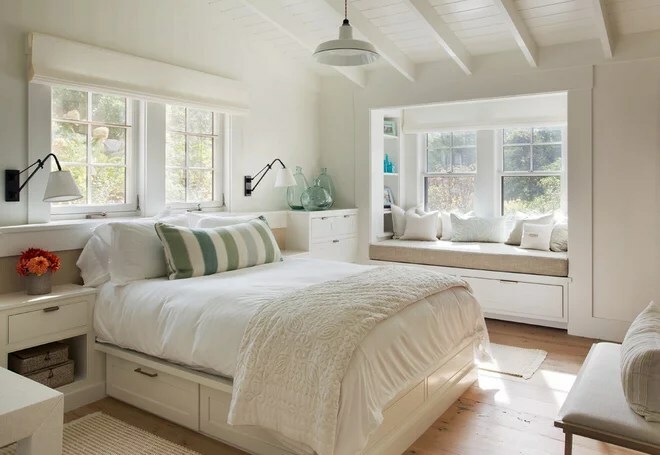 So it’s no surprise that the 25 most popular bedroom photos uploaded recently to Houzz portray that kind of atmosphere. A quick review of the key elements found in the following photos reveals some recurring design moves that deliver the relaxing look. When in doubt, employ gray and gray-blue tones, wood accents and layers of the most comfortable bedding you can find. Here are 25 ways to sleep tight in style. A soaring, cedar-clad ceiling punctuates this picturesque bedroom in South Carolina. Again, gray walls and bedding deliver a soothing, inviting atmosphere that doesn’t distract from the view. 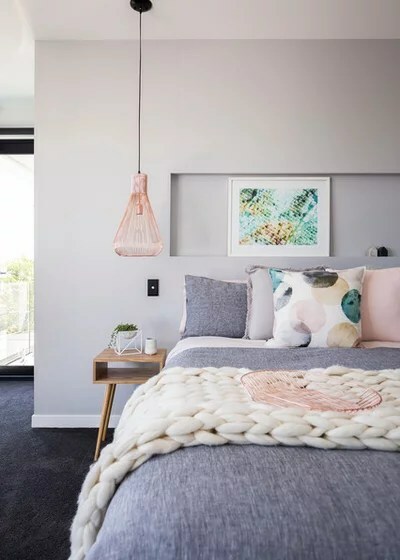 This Birmingham, Alabama, bedroom features many of the recurring elements we’ve seen in this article: gray tones, painted wood ceiling, statement light fixture and layered, neutral bedding. 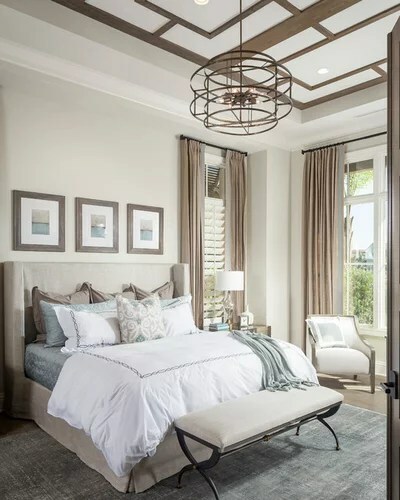 A geometric ceiling treatment and light fixture set a polished, contemporary tone in this Orlando, Florida, bedroom, while simple furnishings and decor in organic tones establish a calm and comfortable attitude. Silvery grays ensconce this London bedroom, while a luxurious collection of bedding gives new meaning to the term beauty sleep. A generous dose of soft white paint creates a refreshing atmosphere in this Massachusetts bedroom. 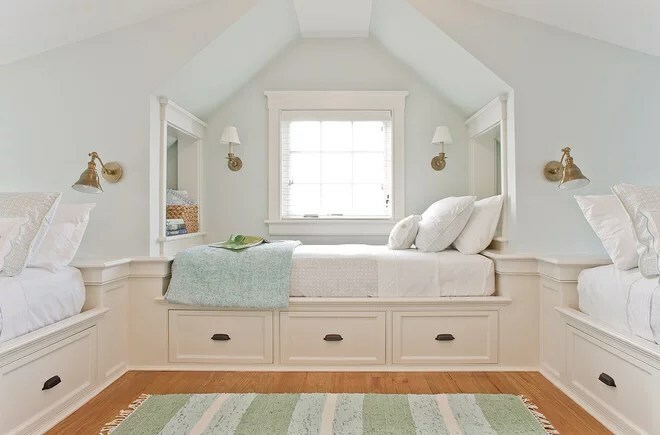 Meanwhile, built-in storage below the window seat and on either side of the bed and below it turns a tranquil space into an organization workhorse. 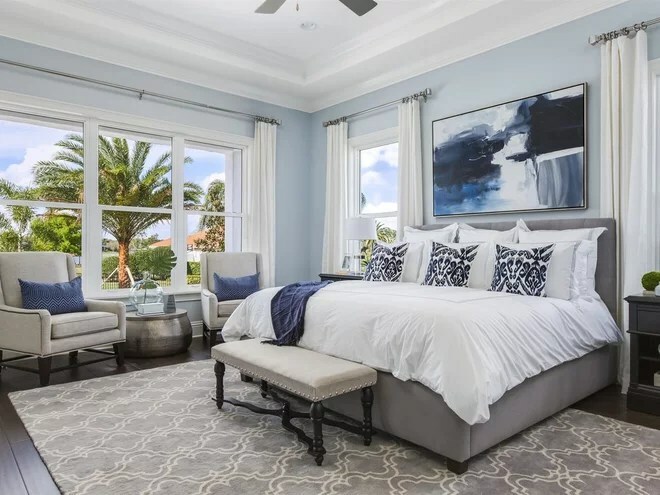 A watery blue wall paint envelopes this Florida bedroom, which is otherwise anchored in grays. 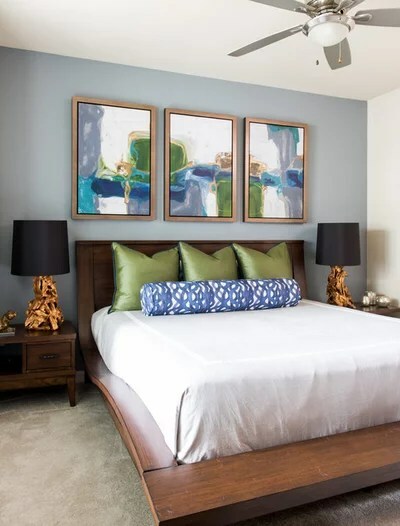 Designer LeTricia Wilbanks did a fantastic job pairing custom pillows with the triptych artwork to create a bedroom full of harmony. This bedroom proves that well-chosen colors and textures can transform any simple space into one brimming with character. Pastel colors set a soothing tone while touchy-feely fabrics beckon one to curl up and stay awhile. Why sleep when you live in a dream world? 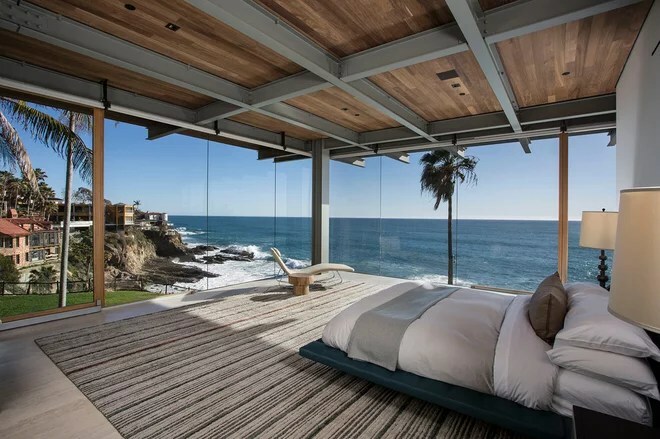 Here, glass walls capture a stunning view of Laguna Beach in Southern California. 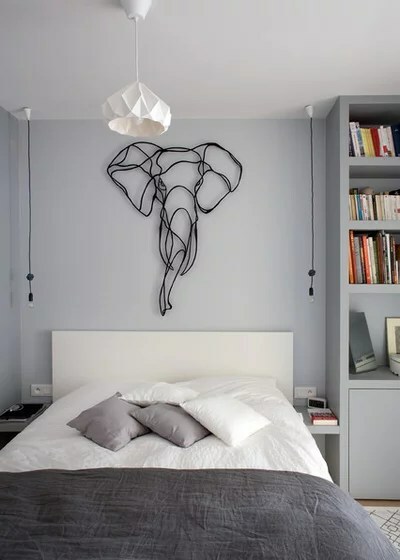 Again, gray tones create a soothing vibe in this Parisian home, but it’s the ropy elephant piece that really sets the room apart. Shiplap walls and antique-style bed frames lend a farmhouse vibe to this South Carolina bedroom. The decor in this bedroom gives the impression of a moment in a movie that’s transitioning from black and white to Technicolor. Cool silvers and grays anchor the look while bursts of pink and turquoise vie for attention. 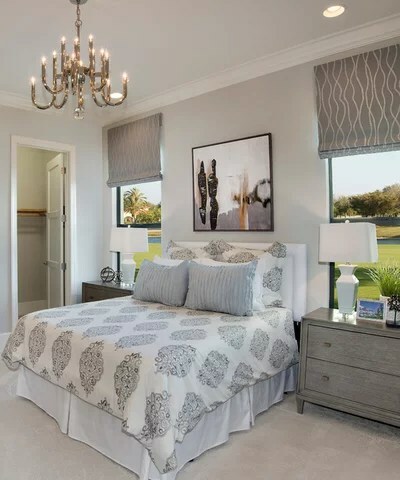 A thoughtful mix of pattern, fabric and colors elevates this Florida bedroom to the next level. 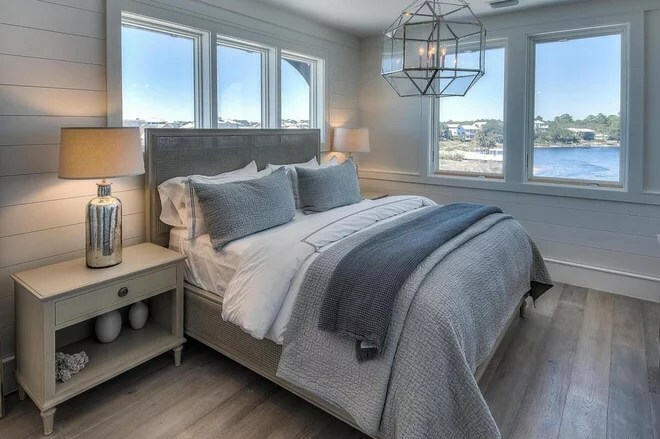 This bedroom on the water in Florida employs a blue-gray color scheme, oak floors and wood slat wall cladding for a coastal look that’s anything but boring. 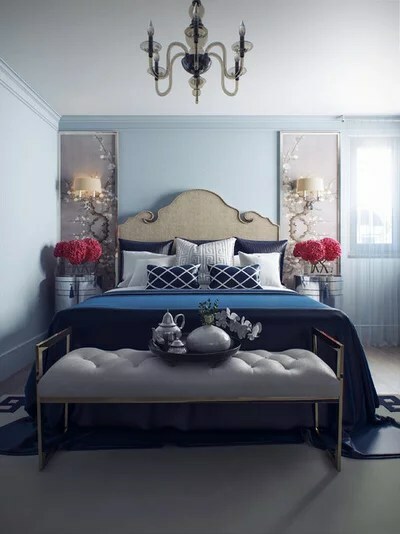 Glamorous doesn’t begin to describe this London bedroom, which features a custom bed, soothing blue wall color, round metal nightstands and an elegant bench. This spacious San Francisco bedroom has a lot going for it. A cool gray color scheme, subtle mix of patterns, textured wallcovering on a feature wall, sliding barn door, rich wood floors and a delightful lounge seat (with breakfast) all come together to make this space a difficult one to leave. 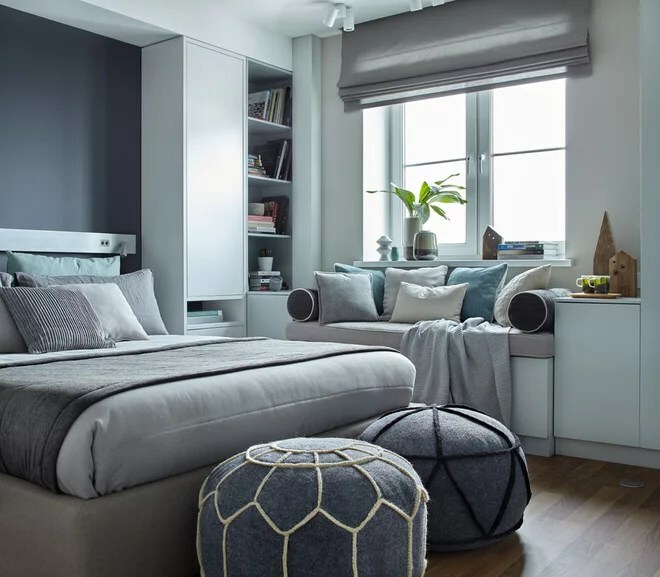 Built-in bedside cabinetry, a window seat and a gray-blue color scheme create a winning combination in this Russian bedroom. 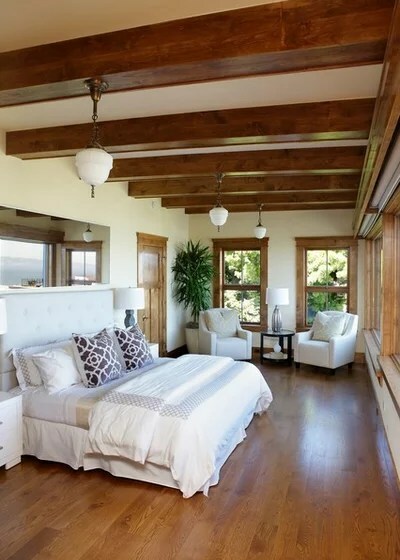 Here, gorgeous wood beams and window millwork lead the eye to a picturesque view of San Francisco Bay. 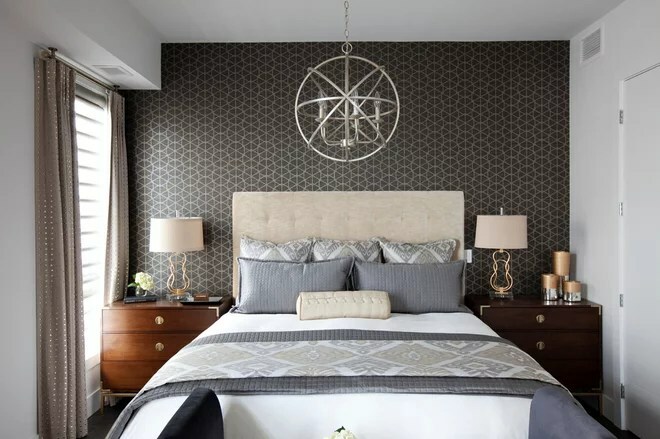 A king-size bed placed against a feature wall with a vinyl wallcovering grabs attention in this bedroom in Calgary, Canada. Three built-in beds with drawer storage maximize space in this quaint Nantucket home. 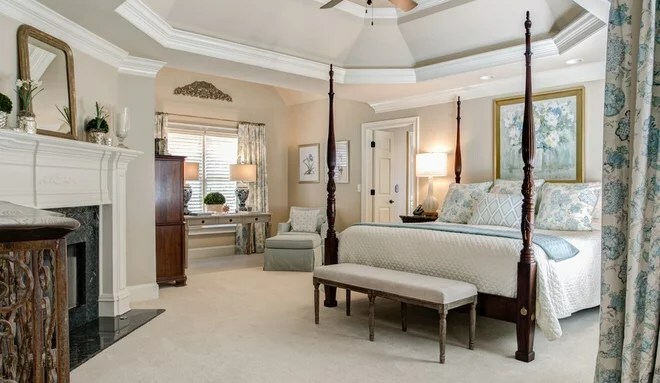 Traditional patterned draperies and a four-poster bed define this large Atlanta bedroom. 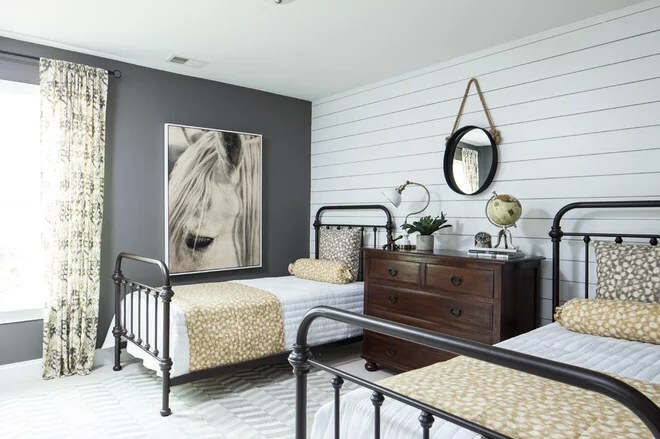 Hat tip to Meridy King Interiors for combining the casual-meets-rustic elements in this bedroom. And kudos to Greg Busch Architects for incorporating the character-heavy wood beams on the ceiling. 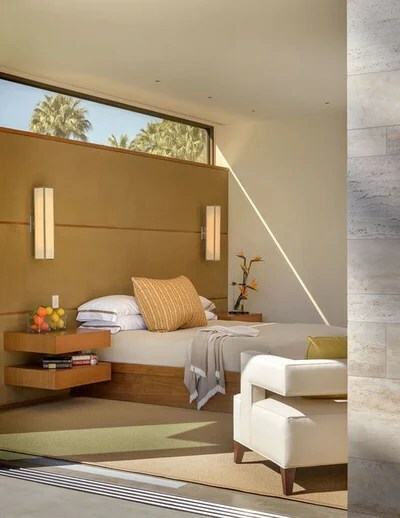 A headboard wall and sleek, modern design up the appeal in this Palm Springs, California, bedroom. Meanwhile, a wall-to-wall window section above the bed cleverly frames a piece of sky. A big, fluffy bedspread, elegant chandelier, soothing wall color and eye-catching bench make this New York bedroom by Jan Hiltz Interiors a hit. 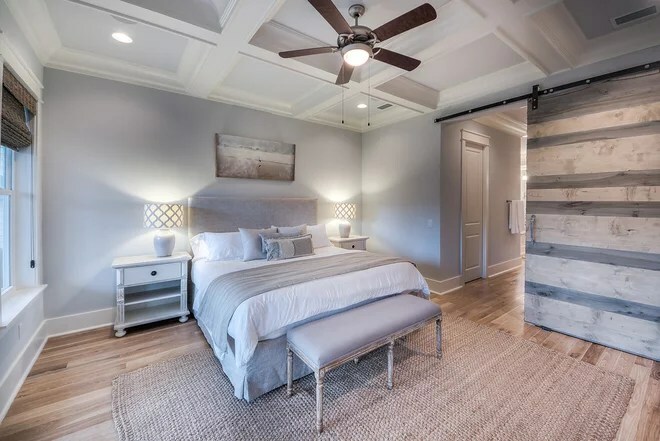 A cool gray tone sets the stage for this exquisite bedroom, the highlight of which is a large wooden sliding barn door. 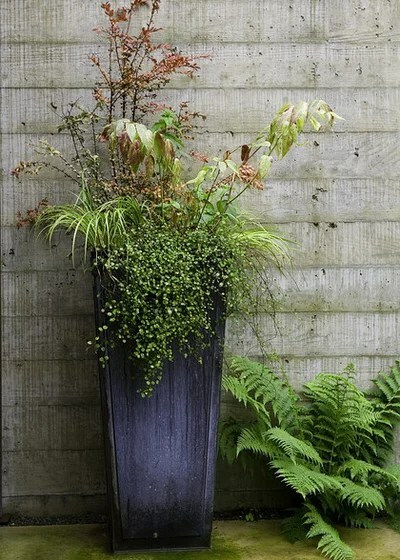 In a tight space, sharp corners are your enemy. 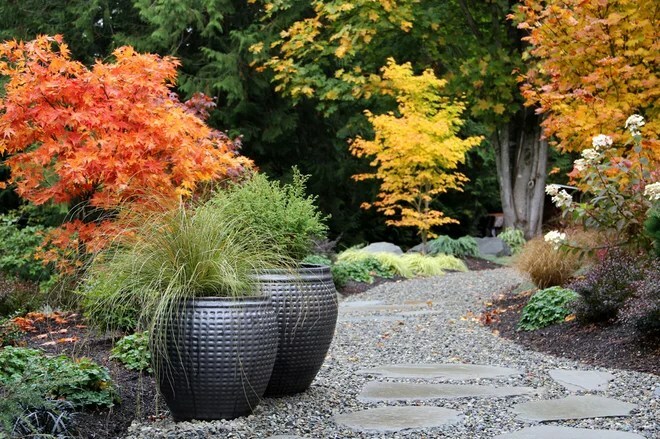 Avoid that awkward sidestep shuffle by going for round dining and coffee tables to create better traffic flow. 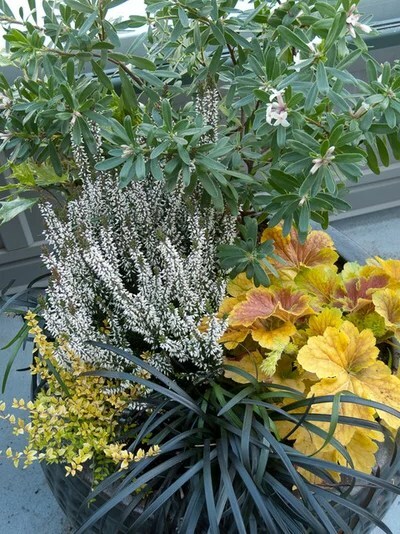 It’ll make your space feel more open. In a cramped bedroom, every square inch of surface space counts. 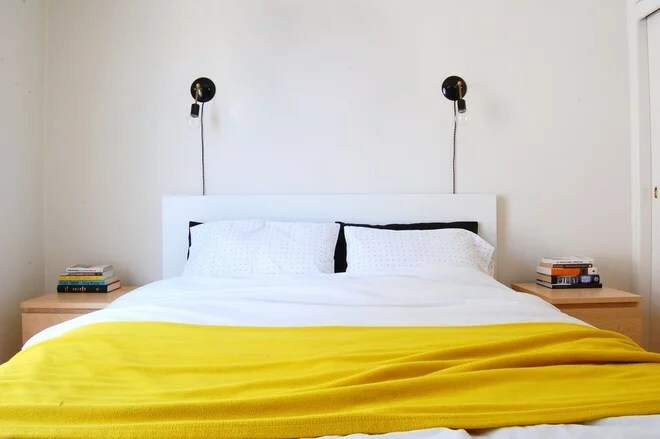 Instead of filling slim nightstand tops with bulky lamps, consider adding wall-mounted lights instead to free up that space for books, phones and more. 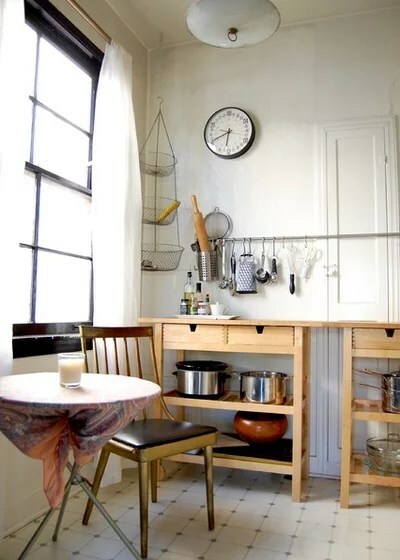 In small kitchens, open shelving is sometimes inevitable. To make some sense of the madness, try sticking with only a few colors for any dishes on them. This will help cut down on some of the visual chaos. Here, the homeowners stuck to a pretty strict scheme of white, black, glass, copper and wood. 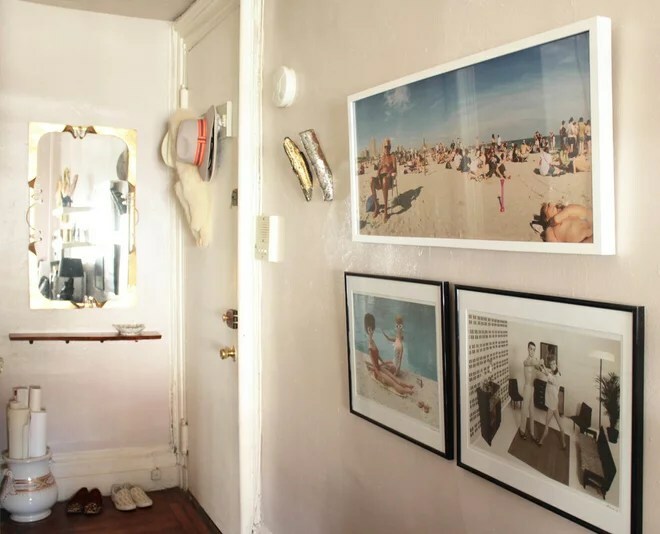 One go-to designer trick in small spaces is to incorporate barely-there or see-through pieces. A clear acrylic desk, like the one shown here, is a great option to create display space or workspace without too much visual noise. 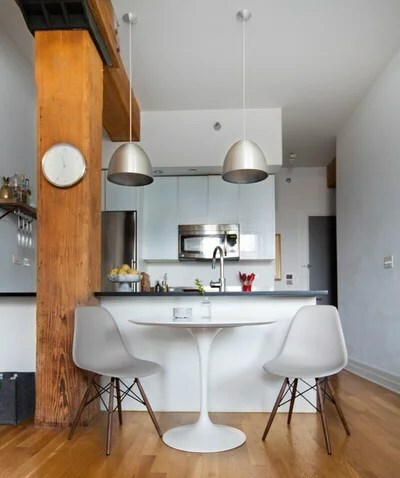 Sure, a large dining set for six might not make sense for your space and lifestyle, but a small table for two can have a big payoff. 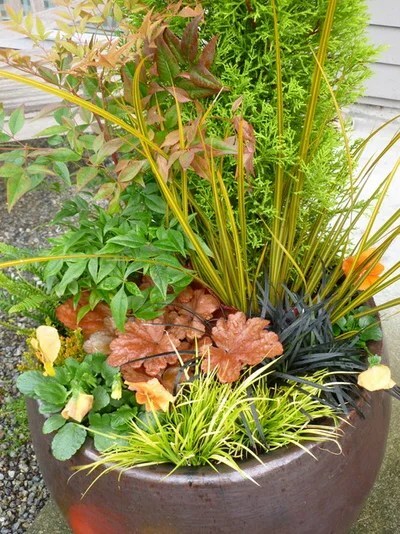 It won’t take up a ton of room, so you can tuck one in a tight corner or just off your kitchen. Being able to have a sit-down meal with your significant other or friend rather than sitting on the floor at your coffee table will make your home feel so much grander. 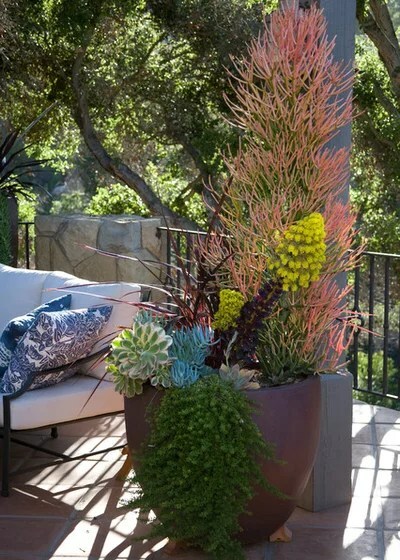 It can also double as a work area, reading nook or table for a morning coffee ritual. 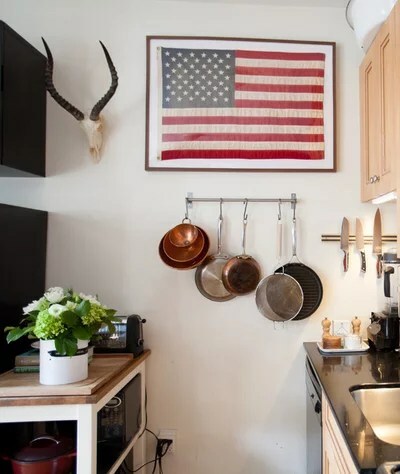 Small homes usually mean small kitchens. And that in turn means kitchen cabinets stuffed with food and utensils. 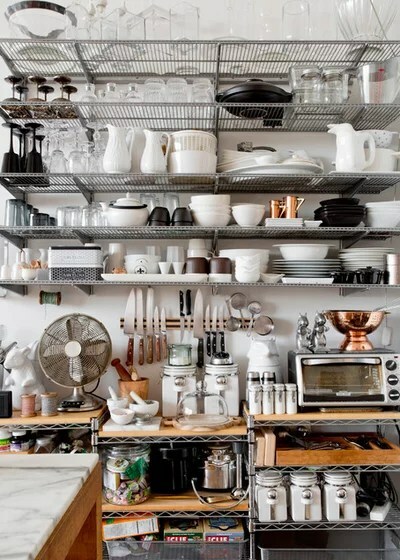 A great way to free up vital cabinet space is to pull those bulky pans out of storage and hang them on a rack. 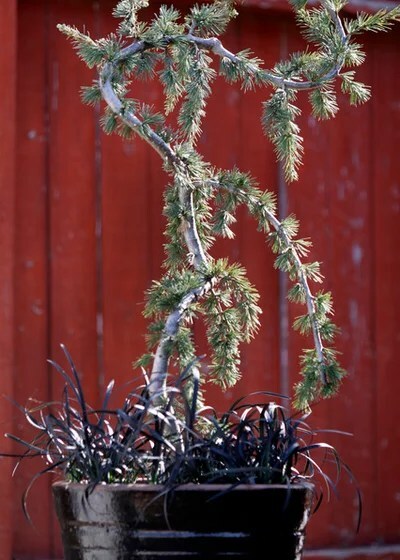 It will put them within arm’s reach and even add a bit of shine to your space. 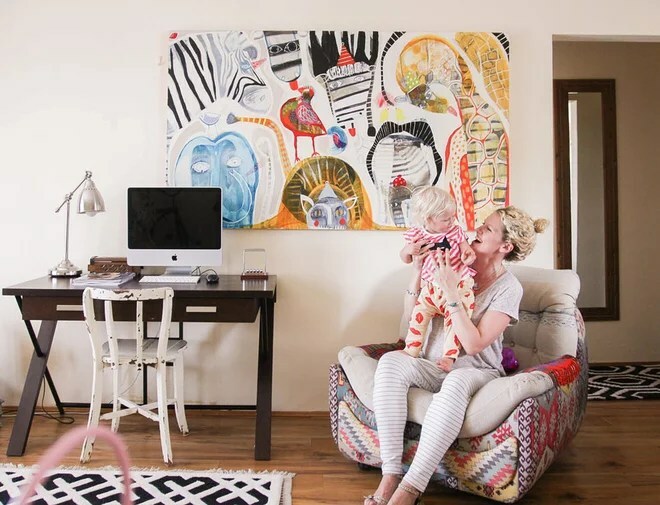 This can be true for any home, but it’s extra important in a small space, where the things you have are always in your line of sight from almost anywhere you are. 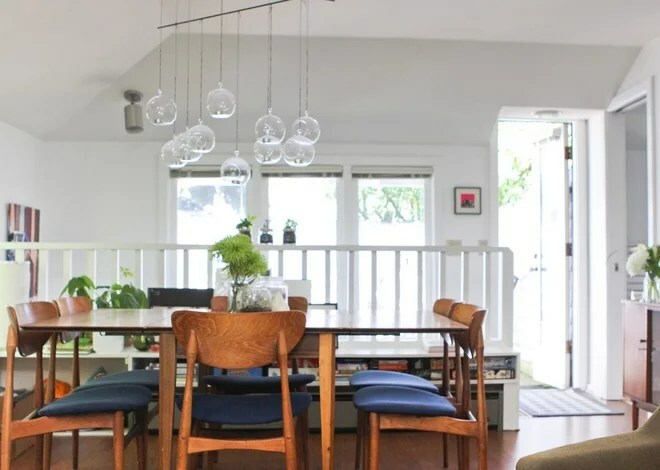 Plus, in small spaces, you tend to interact with your furnishings more, as the pieces you own often do double duty — your dining table is your office desk, for instance.For the midcentury Danish teak dining chairs shown here, Mitchell Pride borrowed money from his parents and paid them back over time to get just what he wanted. It’s kind of a no-brainer, but if you’re looking to make the most of your space, having less stuff to fill it should be your first step. Ask yourself if you really need that TV and media cabinet, or two bulky nightstands, or a large dining table. 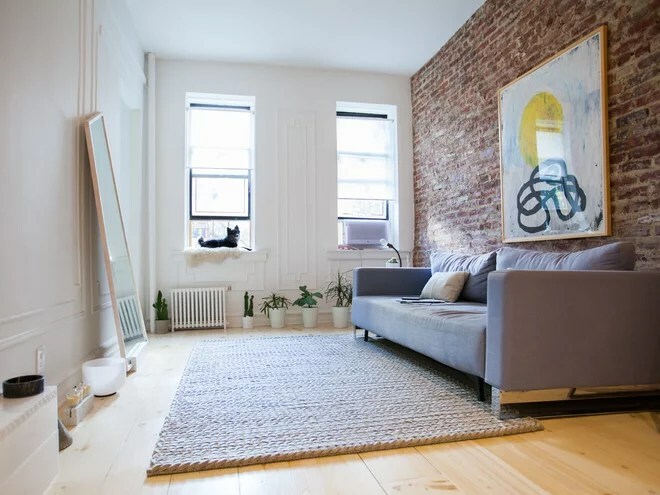 Embracing minimalism and thinking about how your home can extend into the city around you — the library, coffee shops, parks, and so on — might help you reconsider the things you think you need. Don’t settle for the countertops you’re given. Look for carts, tables and cabinets that can offer more surface and storage space. Here, two thin wooden tables get the job done. 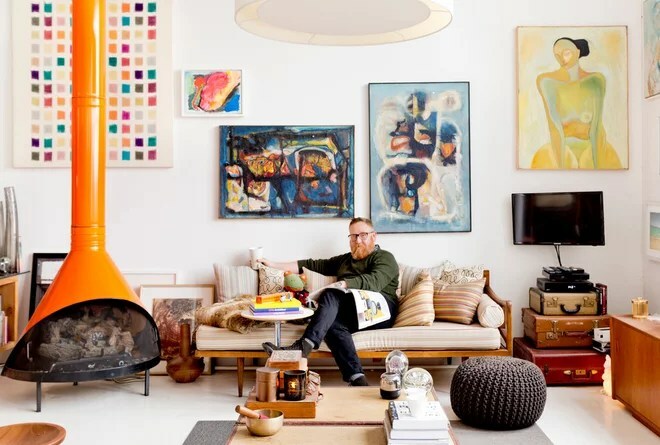 If you don’t entertain that often — most of the time it’s just you, or you and your significant other or friend, lounging around on the sofa — you might wonder why you have so much bulky furniture. 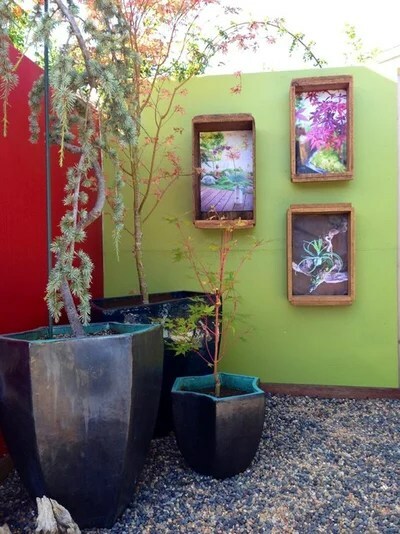 Instead, consider Chinese garden stools, benches and other flexible seating options that can be tucked away when not in use or can serve double duty as tables. 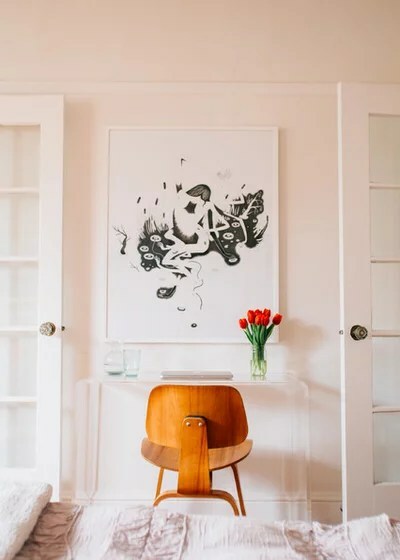 That way you’ll have the extra seats on hand for when you do have people over, but won’t feel like your space is overcrowded with furniture when you’re just flying solo. 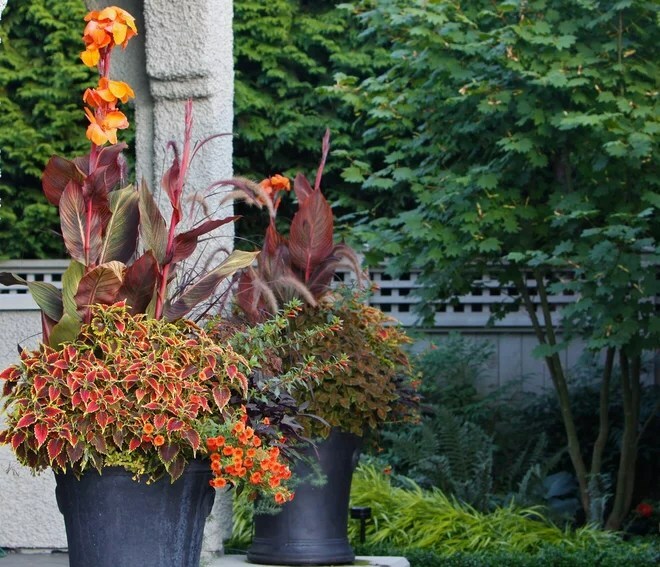 Oftentimes in small spaces, the decorating budget gets spread out evenly among the design decisions. 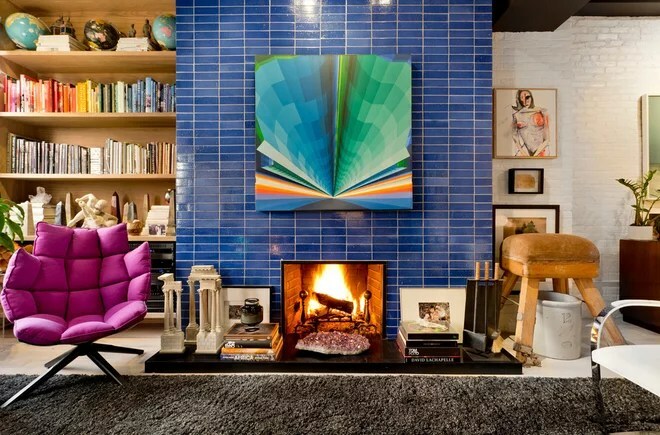 To kick things up, consider splurging on a statement feature, such as covering a fireplace wall in a stunning accent tile, as was done in this New York City living room. 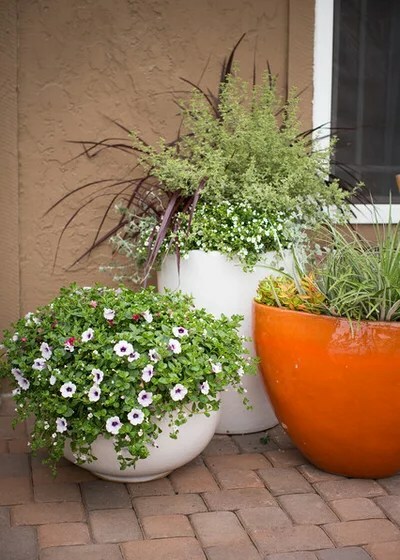 Just because you have a small home, don’t ignore the features of bigger homes. 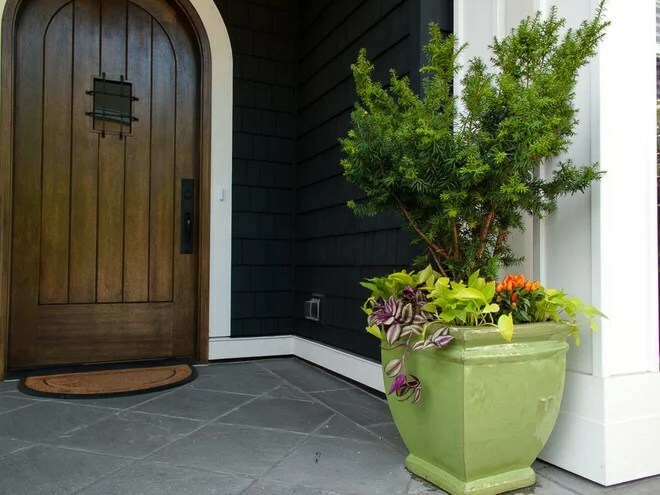 It’s important, for example, to create an entryway even if your space doesn’t exactly have one. 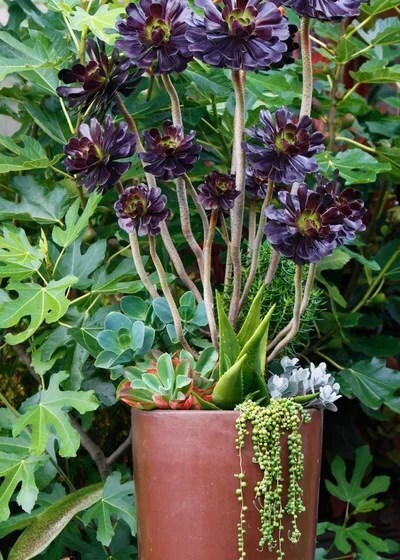 Here, a slim shelf, a mirror and an urn deliver a big-home feature. 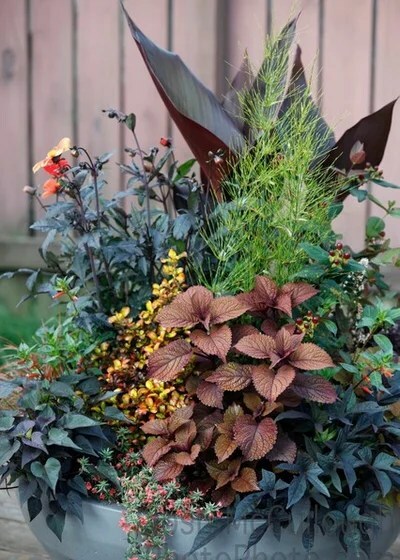 Special Thanks to Mitchell Parker, Houzz Editorial Staff.